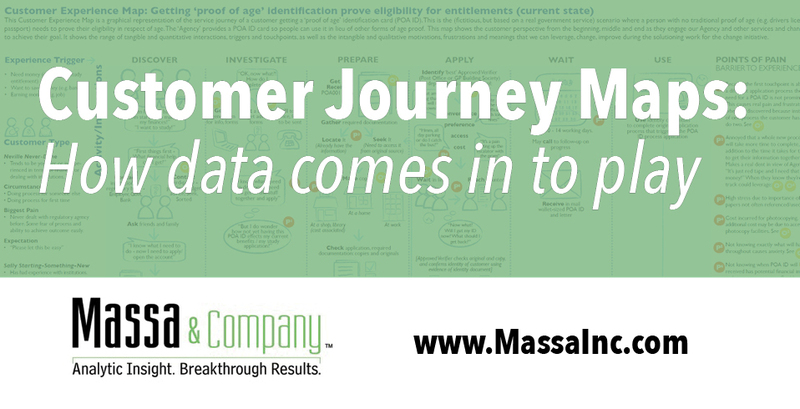 A customer journey map is a visualization of the process that a person goes through in order to accomplish a goal. It’s used for understanding and addressing customer needs and pain points. 1. Divide your customers into the simplest segments by “needs or services/products purchased.” For example, a women’s clothing store might have segments of: business, activewear, swimwear, casual, accessories. 2. Conduct an analysis of shopping frequency among the segments you create in step one. This will help you begin defining the customer segments even more specifically by determining the overall buying cycle per segment. Can it be measured in days or weeks or months? If you’re selling washers, that buying cycle might be 15 years. If you’re selling groceries, it’s likely a week. For the remainder of this example, let’s say it’s 12 months. 3. Looking at those customers who are getting to the end of their buying cycle, make three categories and complete a basket analysis for each. Consider what items are bought together or only by themselves to continue defining the shopper’s need for your products. Who has made one purchase since their first buy 12 months ago? What have they bought? Who has made multiple purchases? What have they bought at the same time or in what order? . Who hasn’t made another purchase, and is therefore likely on their way out? What was their first and only purchase? How did they first engage with you – in store, online or over the phone? What products have they bought? Have they engaged in more than one way, such as signing up for your newsletter and responding to direct mail? How do their basic demographics – age, income, education and other variables – add up? This help you see if customer needs transcend demographic profiles. The customers who first purchase our athletic gear are typically in this demographic, and this is what they’re likely to buy next. The customers who first purchase business attire are typically in this demographic, and they’re likely to buy more business wear after 6 months in these categories. 6. With these pieces tracked, then we can determine what their true engagement looks like to test our personas, tweak them as needed, and begin building unique journeys. As you can see, building these maps begins and ends with collecting data that is valuable to you. You might not know what you can use until you do some of this analysis, but once you have a bunch, you can see what you have that is valuable and can be used to inform your decisions around marketing strategy and tactics. 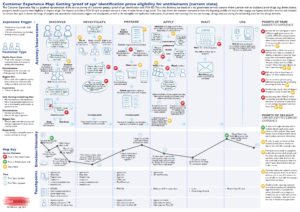 Customer journey maps come in many formats. The key is designing one that’s right for your business and the problems your customers want solved. Take this ridiculously simple example via ConversionXL. It’s basically an Excel document, but it shows exactly what this online business needs, as defined by customers’ (and potential customers’) wants and communication preferences. Then there’s this example, a multi-faceted tax-filing user, via Desonance. With so many personas and needs, it’s no wonder this map is more complicated. But again, it does just what it needs to get complicated information to marketers in a usable format. 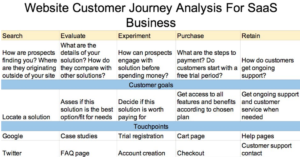 If you’re ready to get started making one of your own, one of my favorite resources is this downloadable customer journey map template from Chicago-based Intechnic. This text right here is one of those delightfully ridiculous transitions that you come to expect from me in this section of the blog. Here is the part where you say, “Bonnie, that was a ridiculous transition.” Why, thank you! Recently, I was visiting family in Tennessee and we made ravioli from scratch one night. What’s not to love about homemade ravioli? As I flew home later that week, I thought about how fun and satisfying it is to make ravioli. How could I combine that with my daily desire for chocolate? Could I make Chocolate Ravioli? I decided to Google this idea, because I was quite sure I was not the first person to think of it! Sure enough, I wasn’t. 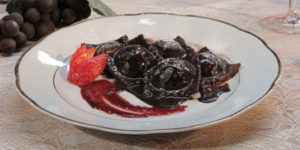 Give this chocolate ravioli recipe a try from the Food Network. (BTW Xfininty has recently removed Food Network from my cable TV package…arrrrrgggghhhh!!!) It will make your brains fall out!